I Think it's quite fun to dye fabric. The process of changing a fabric, by quite a long process and you can't be quite sure what it will look like until it's all dry. The frustrating part with dyeing is when you are after a specific colour, or hue, and the end result ends up something really different. That happened to me this week when I tried to dye my fabric for the undergown of TLJ Leia. First I want to go through the process I use when dyeing fabric, since I don't have a giant pot that I can put on the stove or my own washing machine. When I'm not actively dyeing I keep all my dye stuff in a plastic box up on the attic. In the box I keep the dyes, one large steel pot, a plastic bowl, a plastic whisk and a plastic coat hanger. I make sure to keep my dye utensils clearly separate from other kitchen utensils, since we are talking about chemicals and I don't want to the risk of them getting into any pots or bowls that I might use for cooking. In the box I also have a bottle of white vinegar, since that's used for setting the dye when working with silk. When dyeing fabric you need a big pot of hot water. I simply use the same plastic box that I pack the dye things in. The problem is of course to get the hot water into it, since I can't place it on the stove. I simply need to heat up water in other pots and pour it into the box. How fast this goes depends on the cooking stove. When I used my old electrical stove it could easily take up to an hour to just fill the box with enough water, now when I have and induction stove it goes a lot faster. I use two 5L pots and my 1,7L kettle to heat the water. Here I am in the process of filling the box. 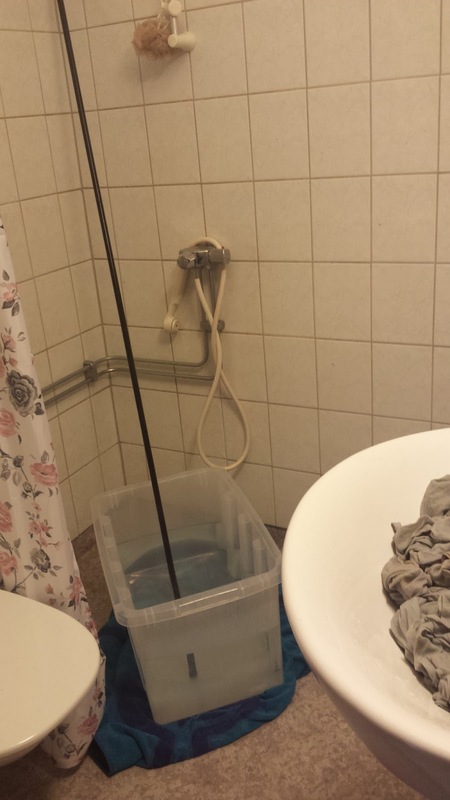 I do the dyeing in my bathroom, since I have a new kitchen floor and I don't want to risk it getting stained. I put a big towel under the box, both to protect the bathroom floor from the heat and from stains. 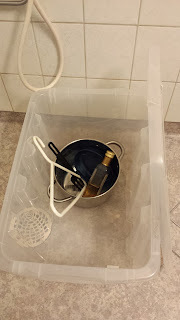 When I have enough hot water in the box I used my dye pot to dissolve the dye and pour it into the box with hot water. Then I add the pre-wetted fabric and stir, for as long as the instructions tell me. The large amount of hot water keeps the heat well enough, so I don't need to add any more hot water once I start the process. I try to book time in my house washing basement though so that I can take the dyed fabric and wash it properly in a mashine, and not just rinse it in water. Now that's all fine and dandy, but as I mentioned as the start even if I dyed the fabric I didn't end up with the wished for result. The fabric I tried to dye was 5 m of cream coloured silk crepe de chine. I wanted it to be a nice grey colour so I used iDye in silver grey. My first mistake was to not do it as described above but use my mother's front loaded washing machine. I don't know if I hadn't dissolved the dye well enough, or if the fabric was still too folded when I put it into the washer. When I was done with the washing the fabric had ugly brown stays in regular intervals where the dye must have attached extra to the fabric. I also felt that the fabric that had dyed grey was too light. If you look up in the photo of my dye set up yo can see the fabric lying in the zink, it's wet so it's a bit darker than it was when it had dried. My second mistake was to think that I could use the two packets of dye that I had left and overdye the fabric, hoping to both hide the stains and to make the fabric darker. Now I would do it by hand and not by machine though, so that I had more control over the process. 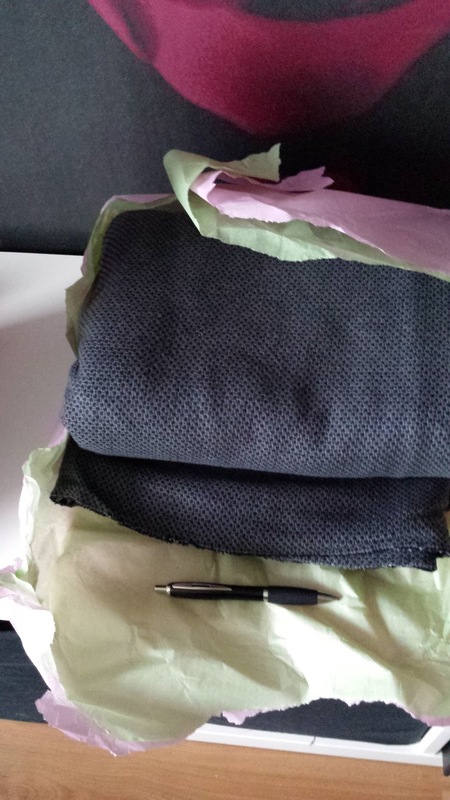 As soon as I put the fabric in the box with dye it was obvious that I wouldn't get the desired colour though. Apparently the dye contains quite a lot of brown pigment, and it was obvious that with this stronger dye mixture it was the brown pigment that dominated. Still I went through with the process, hoping against hope that something would magically happen with the fabric when it dryed. It didn't. This is the end result. Now in some lights it defintiely looks grey, but in other lights it's clearly brown, and especially if you hold up the fabric against true grey fabrics. So now I have 5 m of silk in a light dirt brown colour, if it had at least been dark I could have used it to make a new underdress for Mon Mothma, now I don't know what I'm going to do with it. The quality of the fabric is Lovely though. 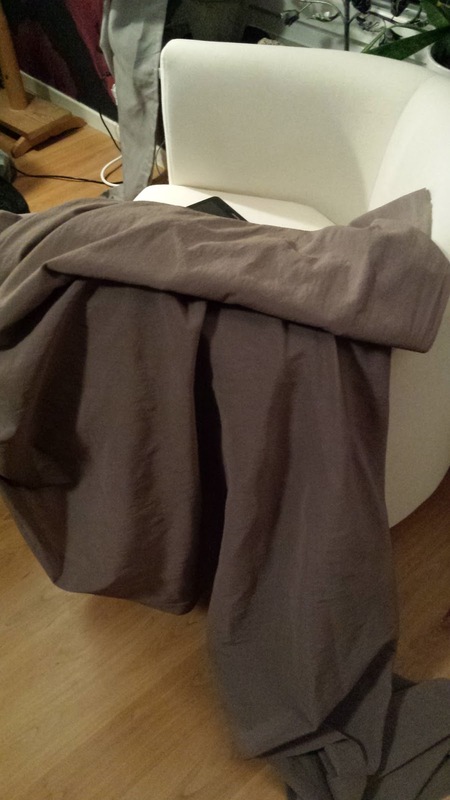 On a more positive note I could pick up the fabric that I have ordered for the TLJ Leia coat. It's not perfect, but with a price of $15/m instead of $130/yard it definitely looks good enough for a first version. Next step is that I need to order more silk crepe de chine, and more dye. I'm thinking of either using Dylon's grey or use the iDye gun metal grey instead of the silver.